The weather cools, the leaves begin to turn, and costumes and candy appear in the aisles of your favorite retailers: for many families, this signals that it's time to engage in the tradition of heading to a local farm to pick the perfect pumpkin to carve, paint, or decorate for Halloween. Before heading out to pick your pumpkin, drink some apple cider, and work your way through a corn maze, consider changing things up this year and visiting a new pumpkin patch. These 10 farms in Kentucky offer difficult corn mazes, large pumpkins patches, and reasonable prices. The draw of Benton Family Farm is in how local it feels-as a family-owned, non-profit organization, Benton Family Farm in Walton feels nothing like some of the more commercial pumpkin patches. Instead, families can get a sense of what it's like to run a farm while engaging in fall favorite activities: pick the perfect pumpkin from a patch, wander through a hay maze, milk a cow, and shear a sheep. Cost of admission to their Pumpkin Days festival is very inexpensive and less crowded than other Kentucky pumpkin patches, but their schedule is limited. Make sure to check their website for days and hours of operation. Holliday Farm & Garden in Hazard offers a huge patch full of every pumpkin and gourd you'll need to create the perfect fall display. A trip to the farm on one of its Family Farm Days in the fall offers inexpensive access to all of the farm's activities, including pumpkin painting, hay rides, and a corn maze. If you're a fan of pumpkin-based foods, make sure to try one of their pumpkin cookies to discover a new fall-favorite treat. Eckert’s-Boyd Orchard in Versailles is unique because it offers a different fall festival theme every weekend of the fall through Halloween. 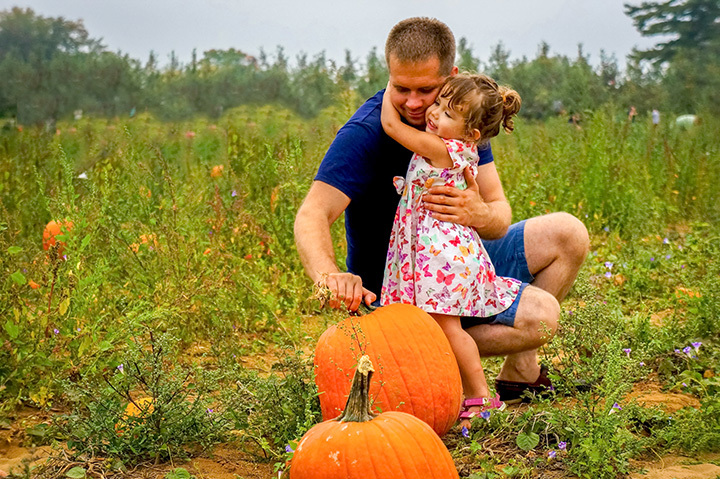 Take a hay ride out to the pumpkin patch to choose your favorite for carving, work your way through a corn maze, take your kids to the petting zoo, and enjoy some fall favorite foods at the Apple Blossom Café. If a big draw for your family is apple treats that appear in fall, you'll enjoy the pumpkin patch, food, and activities at Evans Orchard in Georgetown. While you'll find all of the fall favorites-pumpkin patches, corn mazes, and hay castles-the real draw is in the apple treats. Fresh apple cider, apple pie, apple cider doughnuts, and apple jam will satiate your desire for the tastes of fall and leave you craving the treats that come with your tradition for years to come. Happy Hollow Farms in Calhoun is a family favorite for its traditional fall activities: pumpkin patches, corn mazes, and hay rides. Happy Hollow Farms also offers free showings of family-friendly movies on certain fall evenings, so make sure to bring a blanket so your family can enjoy some fall treats and a show after a day of exploring the farm. Take a hay ride out to a huge pumpkin patch at Devine's in Harrodsburg to pick your perfect pumpkin for carving. After everyone has picked a pumpkin, work your way through a huge corn maze, sit next to a nighttime campfire enjoying some fall-favorite foods and beverages, or pet and feed some animals at the petting zoo. One of the more reasonably-priced pumpkin patches in Kentucky, Devine's offers a full day of family fun that doesn't break the bank. Located in Shelbyville, Gallrein Farms takes about the same amount of time it takes to drive to Huber’s, but the farm is less crowded than its Indiana alternative. This wonderful farm offers excellent u-pick options for pumpkins, hayrides, and much more. It’s the perfect way to spend the day with family and friends. Sometimes just getting the basics is all you need, and Happy Jack's Pumpkin Farm in Frankfort offers just that. Take a hay ride out to a pumpkin patch that spans multiple acres to find the pumpkin of your dreams for this season. If you're looking for more adventure, you can listen to live music or wander through the farm's forest. But in the end, Happy Jack's is more about picking pumpkins than a day full of fun for kids, making it a good place for adults to enjoy the holiday tradition. During the Fall Festival at Kinman Farms in Burlington you can fill your day will pumpkin picking and all kind of other fall family activities. They offer all of the traditional activities like hay rides, petting zoos, and barn animals, but they also offer many activities you won't find at other Kentucky pumpkin patches, such as tricycle ride, carnival tent, corn hole, and laser tag. They even offer live music you can listen to while eating a funnel cake. What's better than picking the perfect pumpkin and then winding your way through a corn maze? Picking the perfect pumpkin, winding your way through a corn maze, and then playing a round of mini golf with your family. You can do all three of these things at Christian Way Farm in Hopkinsville. For a delicious meal, check out the on-site restaurant!